PALEO JAY SMOOTHIE CAFE: Rich Food Poor Food! AND Rich Cat Food! Rich Food Poor Food! AND Rich Cat Food! OK, this is a book review. But it's one that I feel very strongly about! I have long been into nutrient dense eating- by this I mean packing as much nutrition into each and every bite or swallow that you put into your body. This is really why we eat- the nutrition that fuels our each and every cell. Eating, and eating, and eating, day and night, not for "fuel" but simply for the taste sensation! This is the book that can get you back from the brink of that self-destroying path, and back into eating real, God-made foods to maximize your health, and that of your family. And save money doing it, too! If you have never understood about "how and why you should eat paleo", well look no more! AND, I also have a tip or two about Cat Food for the Paleo Cat! 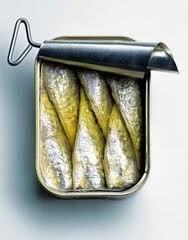 So, I went to the grocery store, and found some inexpensive food that I eat myself! 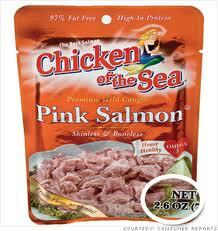 Exhibit B: Small foil packets of wild caught flaked salmon! Paleo Primer- Slim is Simple!